In consequence of the intrigues of Phrixus' stepmother, Ino (others state that he offered himself), he was to be sacrificed to Zeus; but his mother Nephele removed him and Helle, and the two then rode away on the ram with the golden fleece, the gift of Hermes, through the air. According to Hyginus (Fab. 3), Phrixus and Helle were thrown by Dionysus into a state of madness, and while wandering about in a forest, they were removed by Nephele. Between Sigeum and the Chersonesus, Helle fell into the sea which was afterwards called after her the Hellespont; but Phrixus arrived in Colchis, in the kingdom of Aeetes, who gave him his daughter Chalciope in marriage (comp. Schol. ad Apollon. Rhod. ii. 1123, 1149). Phrixus sacrificed the ram which had carried him, to Zeus Phyxius or Laphystius (Schol. ad Apollon. Rhod. ii. 653; Paus. i. 24. § 2), and gave its skin to Aeetes, who fastened it to an oak tree in the grove of Ares. What Was the Golden Fleece? Throughout history, the miraculous skin of the Golden Ram has cried out for interpretation. Since the time of the Ancient Greeks writers and scholars have sought the real story behind the glittering myth. These adventures, however, have been too much adorned by the graces of poetry, to be the proper subjects of historical composition. 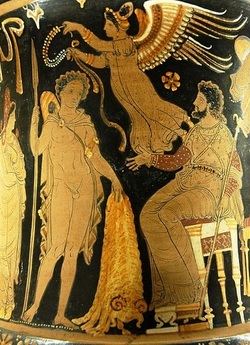 The designs of the Argonauts are veiled under the allegorical, or at least doubtful, phrase, of carrying off the golden fleece; which, though easily explained, if we admit the report that the inhabitants of the eastern banks of the Euxine extended, fleeces of wool, in order to collect the golden particles which were carried down by the torrents from Mount Caucasus, is yet described in such various language by ancient writers, that almost every modem who examines the subject, thinks himself intitled to offer, by way of explanation, some new conjecture of his own. The Fleece derives from a Colchian mining practice whereby fleeces are used to pan gold from rivers. The Fleece is the skin of a man named Ram (Krios), a friend of Phrixus. The Fleece is an alchemical treatise with the secret of turning base metal to gold. The Fleece is a method for writing on parchment in liquid gold. The Fleece represents royal power. The Fleece represents a covenant between humanity and Zeus. The Fleece is a form of weather-magic representing rainstorms. The Fleece symbolizes the rich grain of Colchis. The Fleece represents the power of rebirth for the dying and rising hero of spring. The Fleece represents the sun, the path of the sun, or an attempt to free the sun from winter. The Fleece represents the blonde pubic hair of Aryan women. The Fleece is the gilded prow of the ship carrying Phrixus to exile in Colchis. The Fleece is the skin of a type of yellow sheep from Georgia. The Fleece symbolizes the wealth of ancient Colchis, a land known for its goldworking. The Fleece was a ram-shaped covering for a statue of Zeus. The Fleece was a fabric made from sea-silk. The Fleece represented ancient trade of purple-dyed ram's fleeces for Colchian gold. The Fleece was a type of ram's skin bag used during Hittite religious festivals. The Fleece was the wreckage of an extraterrestrial or Atlantean flying machine. The Fleece is nothing more than a myth. But are any of these theories true? To learn the startling new theory of the origins of the Golden Fleece and the truth behind the myth, read Jason and the Argonauts: The Epic History of a Greek Myth by Jason Colavito.